One Tool. A Few Attachments. Thousands of Projects! The MultiMaster is a variable speed oscillating tool that uses a broad assortment of accessory blades to handle hundreds of previously manual tasks. The secret is in the oscillation. The MultiMaster doesn’t rotate or orbit like other power tools. It oscillates. Oscillation permits you to do extremely fine and delicate work or be more aggressive depending on the accessory blade and material. 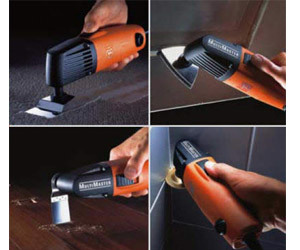 Try the Fein MultiMaster Tool for 30 Days Free!